The Millennium Stadium is the UK's first closed stadium roof, creating a world-class venue for sports, entertainment, cultural events and rock concerts. 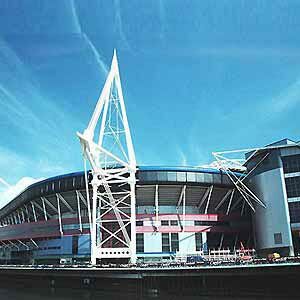 Situated on the former Cardiff Arms Park, the Millennium Stadium is a glittering stone in the crown of Cardiff. It is one of the spectacular stadiums in Europe with a retractable roof and can seat over 70,000 spectators at a time. The Stadium is situated on the banks of the river Taff and enjoys a scenic atmosphere, especially when the match is on. Today, the stadium is the home of Welsh Rugby club. The park was donated by Lord Bute to the people of Cardiff in 1800s and the venue saw the emergence of Cardiff Rugby club in 1876. After series of victories in the county matches, the rugby club proposed the extension of the stadium, which was completed in 1890. Again refurbishment work was undertaken and Millennium Stadium, Cardiff was re-opened in 1999. Till date, the stadium has hosted a number of prestigious sporting and music events including Euro cup matches and World Rugby matches. Apart from sporting events, the biggest rock concert so far hosted by the Millennium Stadium showcased the Welsh band The Manic Street Preachers, performing "You stole the sun from my heart" and many other popular songs for a sell-out audience of 60,000. The stadium has become the economic source for the Welsh side with programmes and matches round the year. The stadium offers three tiers of seating accommodation along with one level of executive boxes. The Millennium stadium Cardiff also offers excellent parking facilities with two basement levels for car parks. The stadium has changing rooms and training facilities with plant rooms at top floor level.